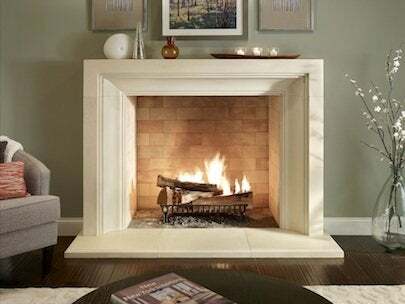 Love the idea of a stone fireplace mantel but turned off by the high price? Eldorado Stone—one of the leading manufacturers of stone veneer siding products—delivers a welcome solution: fireplace surrounds that look just like those made of stone but at a fraction of the price, weight, and installation. Hand-crafted with a proprietary blend of natural limestone, other minerals, and materials, each surround is finished in a labor-intensive four-step process to give it a one-of-a-kind look. Since the product consists of molded profiles rather than solid stone, it is easily shipped and comes complete with mounting brackets, trim, hearthstone, and mantel. Additional accessories are also available. 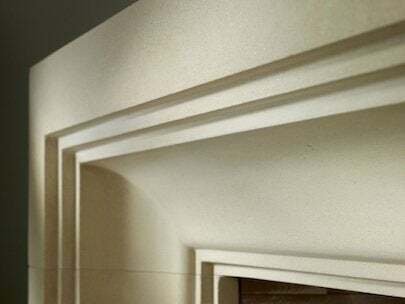 The newest surrounds, which belong to The Soho Boutique collection, add the look of clean-lined limestone to the company’s already diverse selection of surround profiles. They come in three colors—Oyster Shell, Oak Barrel, and Summer Wheat—to complement different kinds of décor, from classic traditional to minimalist modern. The surrounds are also available in three surface finishes—a smooth Honed finish, a weathered, rustic Travertine finish, and a European-style Antique Castello finish—enhancing the customizable design possibilities. And best of all, the fireplace surrounds can be installed by qualified DIYers in jut five easy steps. You can see the product and installation in the video below. To find out more, visit Eldorado Stone.